Many Roman inventions were derived from the advanced technologies developed by the Venetians. Some of these inventions include such innovations as concrete, steam power, hydraulic mining, central heating, screw presses, cranes, and aqueducts. However, there were many technologies that weren't Roman inventions but were monopolized by the Romans to create enormous wealth. The Republic of Venice existed from the 7th century until the late 18th century, and consisted of 110 islands, separated by canals and joined by bridges, in a lagoon along the Adriatic Sea in northern Italy. The Venetians were a seafaring nation with a population of about one hundred thousand. They built merchant ships and were involved in shipping goods. They did well in this business and had knowledge of what people wanted and what they were buying. But what was remarkable about this place, was that it evolved into one of the richest regions in the world in a short period of time and contributed heavily to future Roman inventions. Venice accomplished this feat because of one reason. They decided that instead of shipping products for other countries, they should manufacture and ship their own products. But not just any products. They wanted products that were in demand, and if possible, products that could be monopolized or have little or no competition. The Venetians immigrated inventors and technologies from across Europe and the Middle East with promises of rights, privileges and wealth. The Venetians treated these inventors as their most important citizens and considered them the pillars upon which their wealthy empire would be built. They called these citizens "inventio", from which we derive the word "inventor". The Republic passed a law that granted inventors privileges, wealth and protection. This doctrine was known as "patere", from where the concept of "patents" first originated and it created a system where all innovators would benefit. "We have among us men of great genius, apt to invent and discover ingenious devices... Now, if provisions were made for the works and devices discovered by such persons, so that others who may see them could not build them and take the inventor’s honor [sic} away, more men would then apply their genius, would discover, and would build devices of great utility to our commonwealth." The grants of monopoly "patere" (patent) appealed to many inventors and the Venetians were especially interested in adding new products that related to fabrics or glass - products that were in high demand. While most governments would steal inventions and put inventors in prison, the Republic of Venice treated them as celebrities. The revenues from all these exclusive technologies was enormous. Most of the silk in Europe was being supplied by Venice, instead of China, for enormous profits. The wealth obtained from glass mirrors alone was extremely lucrative. The image reflection of these sheet mirrors was unparalleled and their value was priceless. No one had them except for the Venetians. The Venetians organized their manufacturing into guilds,which were associations whose members were under the guidance of an “inventio” (inventor). These guilds were located in economic zones. Everyone working in them was sworn to secrecy. It was in these areas that the guilds conducted their research, training, development, and production. For example, on one island there were 8,000 glass makers, and on another, there were 2,000 silk weavers. These guilds were supported by an infrastructure of material supply, labor, financing, marketing and shipping from the Republic. Roman inventions would be developed using this same guild system. Inventors were the wealthiest and most prominent citizens in the Republic of Venice and their guilds were protected by a standing army of 8,000 cavalry, 3,000 infantry, and 36,000 sailors operating 3,300 ships. But as quickly as they had achieved all this wealth, suddenly and tragically it vanished. The Republic fell victim to the Bubonic Plague, known as the "Black Death", and eighty thousand Venetians died in seventeen months. Source: Excerpt from 5 Big Lies - On Selling Invention Ideas, Randy Belaire. 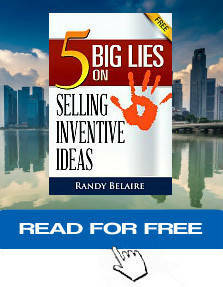 This is one of a series of free ebooks you can receive when you claim a free copy of 5 Big Lies - On Selling Invention Ideas.